Earlier this week, Baccus announced the forthcoming release of their latest set of rules in the Polemos series – Ruse de Guerre, written by Glenn Pearce. This set of rules complements Baccus’ recent releases of several new infantry packs for their French Indian War range – and indeed, new army packs for the FIW will be added to the existing range of Seven Years War figures. However, Ruse de Guerre doesn’t just cover the French Indian War, but also the American War of Independence and the War of 1812. The conflicts of these three wars had a distinctly different character to the European wars of the period, and it is this that the author has attempted to capture. Baccus have released a sample of the rules, which include some notes on troop basing, ranged combat, and an example scenario, as well as the designers notes for the rules. Dave Luff and I have been looking at the French Indian War as the setting of our Sharp practice campaign, and Per Broden has already created a 6mm version of the game for the Joy of Six 2017 (Which I will be umpiring). These mass battle rules may well encourage us to potentially collect our armies in multiple scales – though they will have to go to the back of the current painting queue. 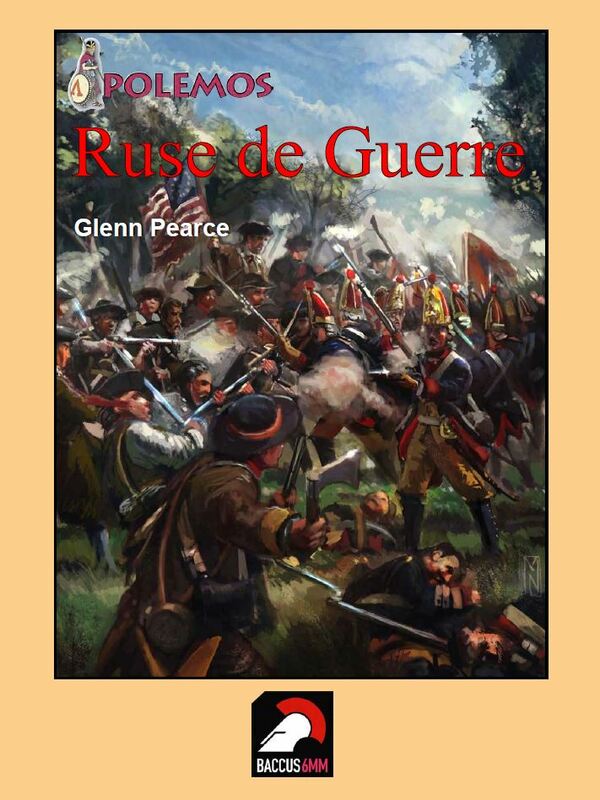 Ruse de Guerre is due for publication at the end of February. Have you ever played any of the Polemos rules? I own the Napoleonic version but have never played them. The actual format and style of them seemed a bit dated. Look forward to any review you do of these new rules for FIW. Just finished reading a small book bought by my daughter for me when she visited Fort Niagara last year called ‘The Gold-Laced Coat’ by Helen Fuller Orton published by the Old Fort Niagara Association. A nice simple read giving a glimpse of the period and situation in New France at the time. We’ve played Marechal d’Empire several times and enjoyed them, but I agree that the format is a little dated, in that they were colour cover but black & white rules. They are generally a decent set of rules, but can take a little getting your head around. Interestingly, Baccus have been working on a phone app to make playing Polemos rules easier and more accessible to play.